We got a special request for this recipe from Diane, so here it is. These are very similar to pancakes and were very often made by grannies for their young grandchildren - they're really easy to make. Here we've given a recipe with Greek strained yoghurt in them, which makes them especially delicious. 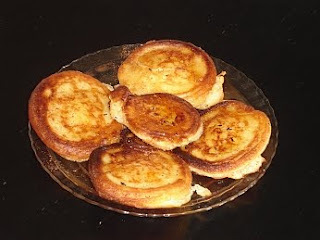 However the most common way of making them, especially in the villages, was just with flour and water - no yoghurt, eggs, butter or sugar that you see in the recipe below - just the flour and enough water to make a thick but runny mixture that could be fried. The honey and cinnamon was then spread on top at the end. Beat the eggs and sugar with a whisk. Add the butter, yoghurt and salt and stir well. Add the flour gradually and continue stirring – avoid lumps – to make a smooth, thick but quite runny mixture. If the mixture is too thick, you can add a little water. Using a ladle, preferably with a small spout, add the mixture in round shapes to the frying pan – as many as your pan will comfortably take. Lower the heat – you don’t want it too strong – and fry the tiganites for approx 1-2 minutes on each side. Remove and place on kitchen paper to drain and continue until you have used all the mixture. Place all the tiganites on a large plate and evenly spread the honey over them and sprinkle the cinnamon over them. Greek Foods are health because they usually use olive oil. I Love Mediterranean foods because they are known for being delicious and healthy. I'm not familiar with strained yogurt. Do you know if it is known by any other name? 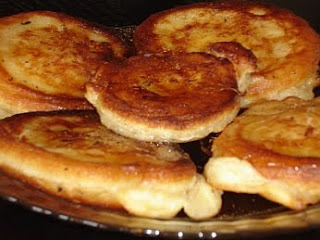 My greek grandfather used to make these for us for breakfast. We dipped them in granulated sugar. It was a special treat! Not very healthy, I guess, but it made an impression on us. He didn't use yogurt in his though.